Aeroflot, Russia’s largest airline group, enjoyed a stronger year-on-year performance in the first half (six months to 30-Jun-2011), in marked contrast to many of its counterparts to the west. 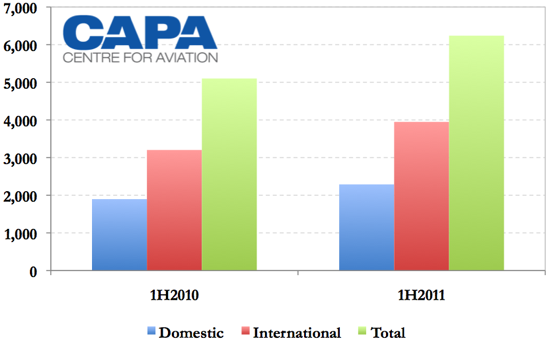 Operating profit increased 28.7% in 1H2011 to USD204.7 million, bolstered by higher revenue, increased passenger numbers, cost control and market share gains. The USD376.8 million net result, a 21-fold increase over 1H2010’s USD17.5 million net profit, was boosted by a one-off gain in finance income. The group booked a USD200 million profit from the sale of non-core assets in the period. The exceptional growth story of Russian aviation continued in 1H2011, with regional stalwart Aeroflot continuing as the leading figure in the market’s development. Passenger numbers in the Russian air transport system increased 11% in 1H2011 to 27.2 million, with international passengers up 10.6% to 13.1 million and domestic passengers up 11.3% to 14.2 million. Aeroflot, which is both the largest domestic and international carrier, remains the key driver of Russia’s growth. The SkyTeam member has long outpaced the system growth rate and 1H2011 was no exception: passenger numbers increased 22.3% year-on-year to 6.2 million, comprising 2.3 million domestic passengers (+20.7%) and 4.0 million international passengers (+23.2%). Aeroflot is almost twice the size of nearest rival Transaero in terms of total passengers carried, and it is one of the fastest-growing airlines in the market. On an absolute basis, Aeroflot carried an additional 1.1 million passengers in 1H2011, which reflects the breakneck pace of its expansion. 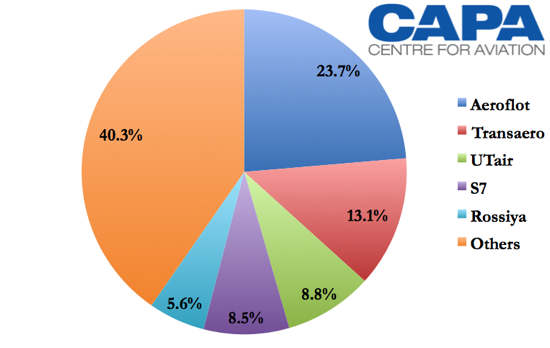 Aeroflot controlled almost a quarter of the Russian market in 1H2011. Aeroflot’s revenue increased 26.4% in the first half to USD2.4 billion. The revenue increase outpaced the 22.3% increase in passenger numbers. While the carrier did not release data on yields, load factors increased in the period by 0.5 ppts to 75.5%. 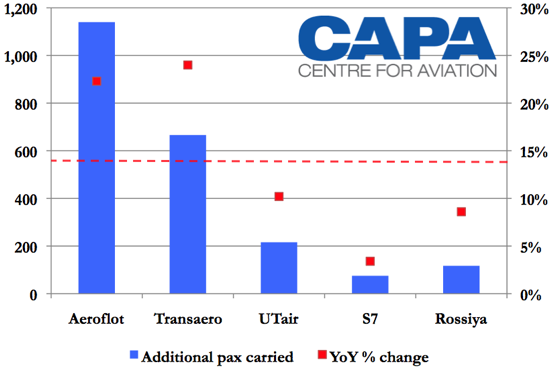 Aeroflot was the only major Russian carrier to increase loads in the first half, as rivals’ aggressive capacity deployment was not met by the same increase in demand. On the cost side, total operating expenses increased 26.2% to USD2.1 billion, led chiefly by fuel, which increased 43.4% to USD616.5 million and labour, which increased 36.6% to USD420.8 million. The first half saw Aeroflot expand internationally by primarily adding frequencies to long-haul and short-haul routes. The increases follow new routes launched at the end of last year to Thailand's Phuket and the Dominican Republic's Punta Cana. In 2H2011 Aeroflot intends to launch or resume services to Mexico's Cancun (twice-weekly), Sri Lanka's Colombo (twice-weekly) and Vietnam's Ho Chi Minh (twice-weekly). While Aeroflot’s operational performance remains impressive, the net result was an even stronger performance as the company disposed of non-core assets. Aeroflot, 51% owned by the Russian state, will be included in the Government’s multi-billion dollar asset sale plan, aimed at reducing the budget deficit and boosting foreign investment. Aeroflot booked a USD200 million profit from the sale of various subsidiaries and affiliated firms, most notably insurance company Moskva and Archangelsk-based airline Nordavia. Aeroflot’s 1H2011 is a strong result, which is particularly impressive in light of the numerous problems faced by the major airlines of western Europe, many of which have revised down their capacity growth forecasts for the winter period, lowered their profit forecasts or both. Aeroflot, with less direct exposure in the troubled markets of North Africa and Japan than its European peers, continues to tap into the booming demand for domestic and international short-haul (CIS) air travel. It remains unclear how long Aeroflot can enjoy success in the face of a looming economic crisis, particularly in the EU, a major Russian trading partner. IATA in Oct-2011 noted that falling business and consumer confidence, ongoing financial crisis in the euro zone and the stagnation in world trade is likely to impact air travel and air freight. The declining load factors will add to the adverse impact this will have on airlines’ profitability, the industry body warned. Aeroflot’s passenger numbers did suffer in the last industry downturn, with group passenger numbers falling 4.5% in 2009 to 8.8 million. Operating income also fell in 2009, down 16% to USD277 million. Critically, however, Aeroflot remained in the black in 2009, a feat the airline has managed to achieve, at both the operating and net levels, in every year of the past decade. Financially, the airline remains in a strong position: net cash flow from operating activities increased in the 1H2011 to USD599 million, and net debt was reduced to USD1.3 billion, down 11% compared to the start of the year. Despite mounting macroeconomic concerns, Aeroflot remains well positioned for growth. The airline has Russia’s most extensive and diverse network, serving over 100 destinations, and retains strong market share of most regions. In both the short- and long-term, Aeroflot remains Russia’s best-positioned airline to benefit from the strengthening of domestic consumer demand for air travel and Russia’s continued integration in international trade markets. There will also likely be opportunities for Aeroflot to further boost market share as a result of high market fragmentation – a problem now being addressed by Russian authorities – and the relative inefficiency of Russia’s smaller players. Aeroflot’s myriad attractive fundamentals will likely continue to drive outperformance relative to its domestic and European peers.